To sustain my claim that the torus (ring) is a completely underestimated geometry in physics and to highlight its versatility I give a link to an amazing video showing in a couple of minutes a number of extraordinary natural occurrences of the torus (plural: tori) and its spatial dynamics. We see air-tori made by dolphins and whales, smoke-tori (the well known smoke-rings by our chain-smoking uncle Charley), the rings rising from a volcano and we see the peculiar interaction of two man-made ‘water-air-tori’. Below I point out some phenomena that I find particularly relevant to the contents of this website. 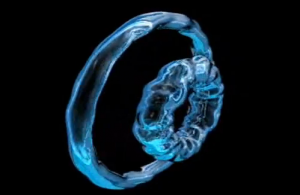 The video opens with an animation of two interacting air-tori in water, toroidal vortices (vortexes) and it is unclear whether this dynamic occurs as presented in nature, but something very similar occurs at the end of the video where a diver produces two water-air-tori, which then interact in a peculiar way and I would like to point at the ‘pumping’ and ‘rolling’ dynamic which draws in and compresses the torus which was outside just before. I think this dynamic of toroidal vortices will prove to be fundamental in nature because it tells us something about the geometry and dynamics of space. I predict that it will become a hot topic in science soon, the torus (corus) and the vortex as the basic constituents of space-geometry, a break-through in quantum physics and relativity, a bridge. The ether is already back on the agenda, although they won’t admit it, vortices are also there, that is all Maxwell-Lorentz, pre-Mach-Einstein, aether-cosmology. 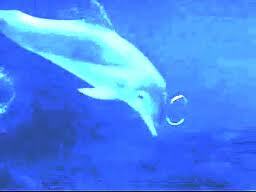 With respect to the dolphins, I would like you particularly to consider whether it is only playfulness or also may be a way of concentrating small organisms in the inner surface of the tori so that it serves to collect food from the water in a clever way, because they swallow them again. Whatever it is it confronts us again with the intelligence of these playful animals and it could be they have something of fundamental importance to tell us, especially so when it turns out not to have any practical purpose for the animal and is just an expression of its ingenuity. Note that the water-torus follows a straight trajectory in uniform motion and that its ‘inertia’ is mainly due to its gyroscopic qualities. It can also grow enormously when rising to the surface possibly helped by the diminishing water-density. What you can conclude here is that without adding any energy a small water-torus, with hardly any momentum and energy to begin with, can grow a thousand- fold when it rises through the pressure differential of the medium it is made of. Buoyancy (upward pressure) as inexhaustible source of energy? Is that not a principle science could transform into effective energy? Worth looking into I’d say. There is also a short ‘coloured toroidal dynamics’ which very much shows what I imagine are the workings of what I call a ‘pixall’, a ‘space-grain’ or ‘space-pixall’, that everything is made of. Versatility. The explosion of an atomic bomb also shows a double torus and then the mushroom shape. The mushroom is known to be one of the fastest growing plants, so an explosion of growth takes the mushroom shape or rather, the mushroom takes the natural explosion shape of space. It is all in the time-scale, the differing time scales is what deludes us, most are beyond our grasp. These last phenomena of seemingly completely unrelated natural things taking the same form has in my approach everything to do with the geometry of space and motion and what can exist by resonance and what not. It is a completely different take on evolution. The theory of evolution, survival of the fittest, of the Darwinists will not survive I expect, the true driving force is the unfolding of intelligence in ever growing complexity, the living form is just the appearance of a materialised intelligence stored in the deep-field.